People dream of their career when they are younger, some of them want to people pilot. But unfortunately due to some reasons not all of us can become pilots and fly planes up in the sky. Biplanes is a game made to fulfill the dreams of people who want to fly a plane. Play this game mark a tick on your list of flying a plane. You will need to enter the name and then the game will start. 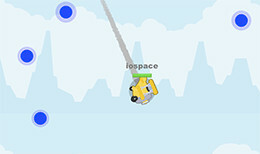 The game is played in the light blue sky with white clouds where there are planes flying. Fly your plane and attack every other plane that comes in your way. All the planes are of same color and type. You will also be attacked so keep on eating the blue food that in available in the sky. Since this game is online you can invite your friends and family in the same server for a challenge too. The game is fun as it seems like for a moment you have become an air force pilot who is fighting for the country taking down the enemies. Good luck with the flying experience. You can play the game by using the mouse of your computer or PC. Use the mouse to move in the direction. For example, slide it towards right to move it to the right side. Shoot by clicking on left and click right to increase the speed of your plane to run.